Sitting here in cold, about-to-be-wet-again Bangalore watching clothes dry, it’s easy to be unconcerned about rivers. One river that supplies our water, the Cauvery, hasn’t been piped to sustain the cancerous metastasis of this city’s suburbs. Another, the once-vivacious Vrushabhavati, has been demoted to a sewer. Of the Penner and Ponnaiyar little is even spoken; they have died in public memory. So, unlike in Chennai or Kolkata or Allahabad or even Mysore, the river remains far from our thoughts. And so it remained until I realised quite by chance that yesterday was India Rivers Day. A hashtag – #IndiaRiversDay – was getting warm on Twitter. So I dug into my archives and found some photographs of rivers that might be worth sharing. The Sainj and Tirthan valleys in Himachal Pradesh treasure the Great Himalayan National Park. Despite a number of hydroelectric projects, the river remains unmolested in its higher reaches. A journey to the many sources of the Ganga can take you far and wide in the Himalaya of Uttarakhand. After reading Stephen Alter’s absorbing and inspiring book, Sacred Waters, the search for these sources took me to Ukhimath on the road towards Gopeshwar. The village rests in the shadow of the Kedarnath peak. On a quiet morning punctuated by birdsong, the roar of the river is a constant refrain. It’s a quiet, muffled, distant roar, and for good reason. The Mandakini, one of the Ganga’s major tributaries, flows deep down in the gorge, hundreds of feet below the village. Viewed from up here, it is a gleaming ribbon of aquamarine and turquoise, depending on the light. The Valley of Flowers is not the most accessible of destinations for the casual trekker. It is reached by a strength-sapping 5-hour walk from Gobindghat to Ghangariya. A 3-km walk from Ghanghariya gets you to the park centre, from where the valley is visible. More walking takes you to the pebbled shore of the Pushpavati, an aptly named mountain river that rises in the lap of the Kamet Glacier and drains the valley as it curls through the impossibly beautiful beds of wildflowers that change colour every month from June to September. The water is cold and milky with silt but wait for it to settle and it’s great to drink. On a clear sunny autumn morning in 2009 I took this picture of the Pushpavati. Among the rivers of southern India, I have a fondness for the Kali. Rising in the Western Ghats of northern Karnataka, it runs a relatively short course of 194 kilometres through the dense jungles of the Dandeli-Anshi Tiger Reserve before it empties into the Arabian Sea. I’ve never rafted in her foaming white waters but those who have done so have never stopped talking about it. And then there is Bhadra. Before she joins her sister Tunga (who, like her, also rises in the hills of Chikmagalur), she is a bright bubbly forest stream, practising her roar in the birdsong-filled woods of Muthodi. 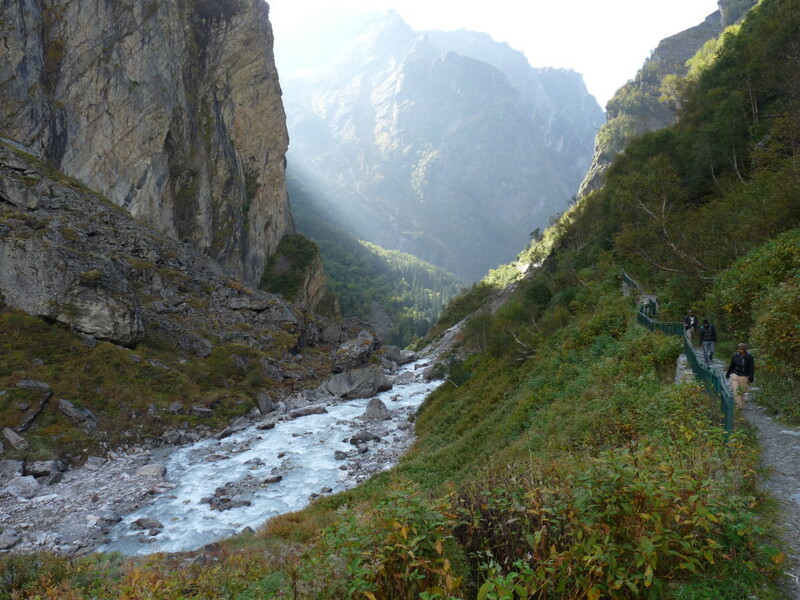 Back to the Himalaya, where the adoration of rivers is inescapable. Walking along the pilgrim path to Ghanghariya from Gobindghat, a river keeps us constant company. This is the Laxman Ganga, which flows through the Bhuyandar Valley and joins the Alakananda at Gobindghat and, before that, the Pushpavati at Ghanghariya. On its course we encounter birds and wildlife. Forktails and redstarts, langurs and martens… they watch and dodge the pilgrim traffic. In spate, a river is monstrous. Her appetite for destruction is insatiable. So it was in 2013 when the Uttarakhand floods saw massive havoc wreaked across the over-burdened pilgrim trails of the Himalaya. In the mountains are the Panch Prayag – the five sacred confluences of the Ganga on her course towards Haridwar, where she enters the plains. One of these is Rudraprayag, where the Alakananda meets the Mandakini. The colours of the two rivers are starkly discernible before they meet — the Mandakini green and clear and the dominant Alakananda turbid with silt. Once they merge, though, the unified river takes on a muddy brown hue. Almost an allegory, that. I have had the good fortune to traverse four of the five Panch Prayags on my various journeys in this region of Himalaya that the faithful know as Devbhumi. My favourite tributaries of the Ganga are two rivers – the Pindar and the Nandakini, both of which rise in the Nanda Devi sanctuary. Of these, the little-known Nandakini, which joins the Alakananda at Nandprayag, is a river of heart-stopping beauty. We crossed a small, trembling foot-bridge over the river on our descent from Bedni Bugyal in 2007. This picture was taken there. There are many more rivers to celebrate but I am partial to adoring rivers in their bubbly, vivacious youth. Up in the mountains where the landscape is still innocent, beyond the wild hunger of civilization. Increasingly, with each visit, I find the sources of rivers compromised, defiled and violated. We parrot the slogan that water is precious, but more precious are the environs that nourish these rivers, preserve them and keep them perennial. The ambitious river-linking programme that is being touted as a panacea for the nation’s thirst threatens to dilute the unique characters of our rivers without a thought for the pristine sources they spring from. It is a formula whose disputable wisdom is anchored in greed and consumption and not in the stewardship of natural resources. If you wish to appreciate India’s rivers, travel along their courses, hike to their sources, see for yourself the flora and fauna and varied ecosystems they sustain. And learn how people interact with them, revere them and fear their wrath. It’s a lesson too precious to ignore.